Support for Shonan Bellmare continues for the 2018 season. Azbil Corporation is a supporter of the Merry Project. 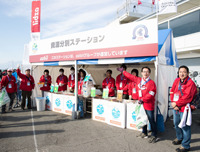 The azbil Group has supported the Shonan International Marathon since the first race in 2007.